What does a condo contract look like in NYC? How complex is it and do you really need a lawyer for it? 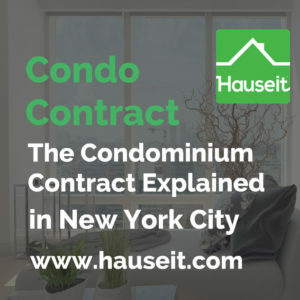 We’ll go over everything you need to know about the condominium contract in NYC and show you what a sample condo contract and contract rider looks like. What Is a Condo Contract in NYC? Do You Need a Lawyer for Real Estate Contracts in NYC? A condo contract is a legally binding agreement between a potential buyer and a potential seller of a condominium unit. Unlike some other states where purchase agreements are simpler forms that are typically not negotiated, a condo contract in NYC can be much lengthier and more complex. A condo contract typically consists of a more standard home sale contract along with a contract rider for the purchaser and a contract rider for the seller. The main condominium contract consists of boiler plate language that is often not negotiated. Most real estate attorneys have an unspoken rule to not make edits to the more standard condominium contract, and instead to negotiate via the contract rider for their respective clients. In fact, it’s often a sign that an attorney does not specialize in real estate transactions in NYC if he or she marks up the boiler plate language on the main condominium contract. Yes. Unlike some states which do not require attorneys for real estate transactions and where Realtors frequently guide buyers and sellers through standard purchase forms, New York law is strict in only allowing lawyers to negotiate and advise clients on legal agreements. In fact, it’s even against New York real estate licensing law for agents to modify or write contracts. Such an infraction is called the unauthorized practice of law and is a punishable offense. You’ll need a real estate attorney in New York to review and negotiate the condo contract on your behalf. Furthermore, you’ll need your attorney to conduct legal and financial due diligence on your prospective purchase. Your lawyer will review the condo offering plan, the board meeting minutes, the building financial statements, the title report and more. An experienced real estate attorney is critical for contract review and diligence! Pro Tip: Even though buying a condo in NYC is a dramatically easier process than buying a coop in NYC, you’ll typically still have to fill out some sort of condo application. Fortunately, you can expect the condo application process to be dramatically shorter and easier than the co-op board approval process. You won’t have to endure a co-op board interview nor fill out a lengthy coop board package! 1. Unit: Seller agrees to sell and convey, and Purchaser agrees to purchase, Unit 3 (“Unit”) in the building (“Building”) known as Manhattan South Condominium (“Condominium”) and located at 555 Fifth Avenue, Apartment 3, New York, NY 10016, together with a 2.75 percent undivided interest in the Common Elements (as defined in para. 6) appurtenant thereto, all upon and subject to the terms and conditions set forth herein. The Unit shall be as designated in the Declaration of Condominium Ownership (as the same may be amended from time to time, the “Declaration”) of the Condominium, recorded in New York County, New York or the By-Laws (as the same may be amended from time to time, the “By-Laws”) of the Condominium. (ii) $900,000.00 representing the balance of the Purchase Price, by certified check of Purchaser or official bank check (except as otherwise provided in this Contract) on the delivery of the deed. (b) All instruments in payment of the Purchase Price shall represent United States currency and be drawn on or issued by a bank or trust company authorized to accept deposits in New York State. All checks in payment of the Downpayment shall be payable to the order of Escrowee (as hereinafter defined). All checks in payment of the balance of the Purchase Price shall be payable to the order of the Seller (or as Seller otherwise directs pursuant to subparas. 6(a)(ix) or 18(b)). (c) Aside from the Downpayment and checks aggregating not more than $1,000, all checks delivered by Purchaser shall be certified or official bank checks as herein provided. 4. Closing of Title: The closing documents referred to in para. 6 shall be delivered, and payment of the balance of the Purchase Price shall be made, at The Closing, to be held on or about August 10, 2018 at the offices of Seller’s attorney or at the office of Purchaser’s lending institution or its counsel; provided, however, that such office is located in either the City or County in which either (a) Seller’s attorney maintains an office or (b) the Unit is located or (c) New York County. (b) The common charges imposed by the Condominium (excluding separately billed utility charges) for the Unit on the date hereof are $880.55 per month. (c) Seller has not received any notice, written or oral, of any intended assessment or increase in common charges not reflected in subpara.5(b). Purchaser acknowledges that it will not have the right to cancel this Contract in the event of the imposition of any assessment or increase in common charges after the date hereof of which Seller has not heretofore received written or oral notice; HOWEVER, PURCHASER IS AWARE OF AN ASSESSMENT OF $125.00 PER MONTH, CURRENTLY SCHEDULED TO END MAY 2019. (d) The real estate taxes for the Unit for the fiscal year of July 1, 2017 through June 30, 2018 are approximately $10,250.00; provided however, Sellers make no representation or warranty as to the accuracy of real estate taxes associated with the Unit. Purchasers shall have the sole responsibility for obtaining information with regards the real estate taxes. (h) Seller is not a “foreign person” as defined in IRC #1445 as amended, and the regulations thereunder (Code Withholding Section). (If applicable, delete and provide for compliance with Code Withholding Section, as defined in para. 17). (v) All keys to the doors of, and mailbox and for, the Unit; and storage units. (xi) Affidavit that a single station smoke detecting alarm device is installed pursuant to New York Executive Law § 378(5). (iv) If required, New York State Equalization Return executed and acknowledged by Purchaser in proper form for submission. (iii) The Condominium is a valid condominium created pursuant to RPL Art. 9-B and the Title Company will insure the same. (d) The delivery and acceptance of the Deed at the Closing shall be deemed to constitute full compliance by Seller with all of the terms, conditions and covenants of this Contract on Seller’s part to be performed, other than those expressly set forth herein to survive the Closing. (iii) If fuel is separately stored with respect to the Unit only, the value of fuel stored with respect to the Unit at the price then charged by Seller’s supplier (as determined by a letter or certificate to be obtained by Seller from such supplier), including any sales taxes. (b) If at the time of Closing the Unit is affected by an assessment which is or may become payable in installments, then, for the purposes of this Contract, only the unpaid installments which are then due shall be considered due and are to be paid by Seller at the Closing. All subsequent installments at the time of Closing shall be the obligation of Purchaser. (c) Any errors or omissions in computing closing adjustments shall be corrected. This subpara. 7c shall survive the Closing. (d) If the Unit is located in the City of New York, the “customs in respect to title closings” recommended by The Real Estate Board of New York, Inc., as amended and in effect on the date of Closing, shall apply to the adjustments and other matters therein mentioned, except as otherwise provided herein. 8. Right of First Refusal: If so provided in the Declaration or By-Laws, this sale is subject to and conditioned upon the waiver of a right of first refusal to purchase the Unit held by the Condominium and exercisable by the Board. Seller agrees to give notice promptly to the Board of the contemplated sale of the Unit to Purchaser, which notice shall be given in accordance with the terms of the Declaration and By-Laws, and Purchaser agrees to provide promptly all applications, information and references reasonably requested by the Board. If the Board shall exercise such right of first refusal, Seller shall promptly refund to Purchaser the Downpayment (which term, for all purposes of this contract, shall be deemed to include interest, if any, earned thereon, and title charges including but not limited to examination of title and departmental charges) and upon the making of such refund this Contract shall be deemed cancelled and of no further force or effect and neither party shall have any further rights against, or obligation or liabilities to, the other by reason of this contract. If the Board shall fail to exercise such right of first refusal within the time and in the manner provided for in the Declaration or By-Laws or shall declare in writing its intention not to exercise such right of first refusal (a copy of which writing shall be delivered to Purchaser promptly following receipt thereof), the parties hereto shall proceed with this sale in accordance with the provisions of this contract. 9. Processing Fee: Seller shall, at the Closing, pay all fees and charges payable to the Condominium (and/or its managing agent) in connection with this sale, including, but not limited to, any processing fee, the legal fees, if any, of the condominium’s attorney in connection with this sale and, unless otherwise agreed to by Seller and Purchaser in writing, all “flip taxes,” transfer or entrance fees or similar charges, if any, payable to or for the ‘Condominium or otherwise for the benefit of the Condominium unit owners, which arise by reason of this sale. Except as provided above, Purchaser shall pay when due any and all application, credit search and/or credit report fees payable by purchasers to the Condominium (and/or its managing agent) in connection with the review of any application or documents required by the Condominium from the Purchaser. Purchaser shall also pay any move-in or elevator fees or deposits required by the Condominium or its managing agent, relating to the move-in. Seller will pay all move-out or elevator fees or deposits relating to its move-out . 10. No Other Representations: Purchaser has examined and is satisfied with the Declaration, By-Laws and rules and regulations of the Condominium as amended, or has waived the examination thereof. Purchaser has inspected the Unit, its fixtures, appliances and equipment and the personal property, if any, included in this sale, as well as the Common Elements of the Condominium, and knows the condition thereof and, subject to subpara. 5(f), agrees to accept the same “as is,” i.e., in the condition they are in on the date hereof, subject to normal use, wear and tear between the date hereof and the Closing. Purchaser has examined or waived examination of the last audited financial statements of the Condominium, and has considered or waived consideration of all other matters pertaining to this Contract and to the purchase to be made hereunder, and does not rely on any representations made by any broker or by seller or anyone acting or purporting to act on behalf of Seller as to any matters which might influence or affect the decision to execute this Contract or to buy the Unit, or said personal property, except those representations and warranties which are specifically set forth in this Contract. 11. Possession: Seller shall, at or prior to the Closing, remove from the Unit all furniture, furnishings and other personal property not included in this sale, shall repair any damage caused by such removal, and shall deliver exclusive possession of the Unit at the Closing, vacant, broom-clean and free of tenancies or other rights of use or possession. 12. Access: Seller shall permit Purchaser and its architect, decorator or other authorized persons to have the right of access to the Unit between the date hereof and the Closing, a maximum of 3 times, for the purpose of inspecting the same and taking measurements, at reasonable times and upon reasonable prior notice to Seller (by telephone or otherwise). Further, Purchaser shall have the right to inspect the Unit at a reasonable time during the 24-hour period immediately preceding the Closing. 13. Defaults and Remedies: (a) If purchaser defaults hereunder, Seller’s sole remedy shall be to retain the Downpayment as liquidated damages, it being agreed that Seller’s damages in case of Purchaser’s default might be impossible to ascertain and that the Downpayment constitutes a fair and reasonable amount of damages under the circumstances and is not a penalty. (b) If Seller defaults hereunder, Purchaser shall have such remedies as Purchaser shall be entitled to at law or in equity, including, but not limited to, specific performance. 14. Notices: Any notice, request or other communication (“Notice”) given or made hereunder (except for the notice required by para. 12), shall be in writing and either (a) sent by any of the parties hereto or their respective attorneys, by registered or certified mail, return receipt requested, postage prepaid, or (b) delivered in person or by overnight courier, with receipt acknowledged, to the address given at the begin- ning of this Contract for the party to whom the Notice is to be given, or to such other address for such party as said party shall hereafter designate by Notice given to the other party pursuant to this para. 14. or (c) by confirmed facsimile transmission. Each Notice mailed shall be deemed given on the fourth business day following the date of mailing and each Notice delivered in person or by overnight courier or by confirmed facsimile shall be deemed given when delivered. Copies of all Notices to Seller shall be given simultaneously in like manner to Seller’s attorney, Loeb & Stern, PLLC, 212 Fifth Avenue, Floor 2, New York, NY 10034, Attention Takeshi Kovak, Esq.. Copies of all Notices to Purchaser shall be given simultaneously in like manner to Purchaser’s attorney, Bill Jones, Esq. The attorneys for the respective parties shall be authorized and permitted to deliver and receive Notice on behalf of the Seller and Purchaser. 15. Purchaser’s Lien: The Downpayment and all other sums paid on account of this Contract and the reasonable expenses of the examination of title, and departmental violation searches in respect of, the Unit are hereby made a lien upon the Unit, but such lien shall not continue after default by Purchaser. 16. Downpayment in Escrow: (a) Seller’s attorney (“Escrowee”) shall hold the Downpayment for Seller’s account in escrow in a segregated bank account at the depository identified at the end of this Contract until Closing or sooner termination of this Contract and shall pay over or apply the Downpayment in accordance with the terms of this para.16. Escrowee shall not hold the Downpayment in an interest-bearing account for the benefit of the parties. If interest is held for the benefit of the parties, it shall be paid to the party entitled to the Downpayment and the party receiving the interest shall pay any in-come taxes thereon. If interest is not held for the benefit of the parties, the Downpayment shall be placed in an IOLA account or as otherwise permitted or required by law. The Social Security or Federal Identification numbers of the parties shall be furnished to Escrowee at the end of this contract. At closing, the Downpayment shall be paid by Escrowee to Seller. If for any reason Closing does not occur and either party gives Notice (as defined in para.14) to Escrowee demanding payment of the Downpayment, Escrowee shall give prompt Notice to the other party of such demand. If Escrowee does not receive such Notice of objection within such 10 day period or if for any other reason Escrowee in good faith shall elect not to make such payment, Escrowee shall continue to hold such amount until otherwise directed by Notice from the parties to this Contract or a final, nonappealable judgment, order or decree of a court of competent jurisdiction. However, Escrowee shall have the right at any time to deposit the Downpayment with the clerk of a court in the county in which the Unit is located and shall give Notice of such deposit to Seller and Purchaser. Upon such deposit or other disbursement in accordance with the terms of this para. 16, Escrowee shall be relieved and discharged of all further obligations and responsibilities hereunder. (b) The parties acknowledge that, although Escrowee is holding the Downpayment for Seller’s account, for all other purposes Escrowee is acting solely as a stakeholder at the request of the parties and for their convenience and that Escrowee shall not be liable to either party for any act or omission on its part unless taken or suffered in bad faith or in willful disregard of this Contract or involving gross negligence on the part of Escrowee. Seller and Purchaser jointly and severally agree to defend, indemnify and hold Escrowee harmless from and against all costs, claims and expenses (including reasonable attorneys’ fees) incurred in connection with the performance of Escrowee’s duties hereunder, except with respect to actions or omissions taken or suffered by Escrowee in bad faith or in willful disregard of this Contract or involving gross negligence on the part of Escrowee. (c) Escrowee may act or refrain from acting in respect of any matter referred to herein in full reliance upon and with the advice of counsel which may be selected by it (including any member of its firm) and shall be fully protected in so acting or refraining from action upon the advice of such counsel. (d) Escrowee acknowledges receipt of the Downpayment by check subject to collection and Escrowee’s agreement to the provisions of this para. 16 by signing in the place indicated in this Contract. (e) Escrowee or any member of its firm shall be permitted to act as counsel for Seller in any dispute as to the disbursement of the Down-payment or any other dispute between the parties whether or not Escrowee is in possession of the Downpayment and continues to act as Escrowee. (f) Escrowee shall be protected in reasonably relying upon the accuracy, acting in reliance upon the contents, and assuming the genuineness, of any notice, demand, certificate, signature, instrument or other document which is given to Escrowee pursuant to this Contract without the necessity of Escrowee verifying the truth or accuracy of any such notice, demand, certificate, signature, instrument or other document. (g) Escrowee shall not be bound by any other agreement or understanding between the parties hereto, whether or not Escrowee has knowledge thereof or consents thereto unless such consent is given in writing. (h) Escrowee’s sole duties and responsibilities shall be to hold and disburse the Downpayment in accordance with this Contract. (i) Provided that the Escrowee shall deposit the Downpayment in an FDIC insured account, the Escrowee shall not have any liability or obligation for loss of all or any portion of the Downpayment by reason of the insolvency or failure of the institution or depository with whom the escrow account is maintained. (j) Escrowee may at any time resign hereunder by giving notice of its resignation to Seller and Purchaser at least ten (10) days prior to the date specified for such resignation to take effect and, upon the effective date of such resignation, the Downpayment shall be delivered by Escrowee to such person or entity as Seller and Purchaser may have designated, whereupon all duties and obligations of the Escrowee named herein shall cease and terminate. If no such person or entity shall have been designated by the date which is five (5) days prior to the date specified for such resignation to take effect then Escrowee may designate a law firm or bank in New York City to act as escrowee hereunder. 17. FIRPTA: Seller represents and warrants to Purchaser that Seller is not a “foreign person” as defined in IRC § 1445, as amended, and the regulations issued thereunder (“Code Withholding Section”). At the Closing Seller shall deliver to Purchaser a certification stating that Seller is not a foreign person in the form then required by the Code Withholding Section. In the event Seller fails to deliver the aforesaid certification or in the event that Purchaser is not entitled under the Code Withholding Section to rely on such certification, Purchaser shall deduct and withhold from the Purchase Price a sum equal to 15% thereof and shall at Closing remit the withheld amount with the required forms to the Internal Revenue Service. 18. Title Report; Acceptable Title: (a) Purchaser shall promptly after the date hereof, or after receipt of the mortgage commitment letter, if applicable, order a title insurance report from the Title Company. Promptly after receipt of the title report and thereafter of any continuation thereof and supplements thereto, Purchaser shall forward a copy of each such report, continuation or supplement to the attorney for Seller. Purchaser shall further notify Seller’s attorney of any other objections to title not reflected in such title report of which Purchaser becomes aware following the delivery of such report, reasonably promptly after becoming aware of such objections. (c) Seller shall convey and Purchaser shall accept fee simple title to the Unit in accordance with the terms of this Contract, subject only to: (a) the Permitted Exceptions and (b) such other matters as (i) the Title Company or any other title insurer licensed to do business by the State of New York shall be willing, without special or additional premium, to omit as exceptions to coverage or to except with insurance against collection out of or enforcement against the Unit (ii) shall be accepted by any lender which has committed in writing to provide mortgage financing to Purchaser for the purchase of the Unit (“Purchaser’s Institutional Lender”), except that if such acceptance by Purchaser’s Institutional Lender is unreasonably withheld or delayed, such acceptance shall be deemed to have been given. (d) Notwithstanding any contrary provisions in the Contract, express or implied, or any contrary rule of law or custom, if Seller shall be unable to convey the Unit in accordance with this Contract (provided that Seller shall release, discharge or otherwise cure at or prior to Closing any matter created by Seller after the date hereof and any existing mort-gage, unless this sale is subject to it) and if Purchaser elects not to complete this transaction without abatement of the Purchase Price, the sole obligation and liability of Seller shall be to refund the Downpayment to Purchaser, together with the reasonable cost of the examination of title and departmental violation searches in respect of, the Unit, and upon the making of such refund and payment, this Contract shall be deemed cancelled and of no further force or effect and neither party shall have any further rights against, or obligation or liabilities to, the other by reason of this contract. However, nothing contained in the subpara. 18(d) shall be construed to relieve Seller from liability due to a willful default. (ii) To complete the purchase in accordance with this Contract with- out reduction in the Purchase Price, except as provided in the next sent-ence. If Seller carries hazard insurance covering such loss or damage, Seller shall turn over to Purchaser at the Closing the net proceeds actually collected by Seller under the provisions of such hazard insurance policies to the extent that they are attributable to loss of or damage to any property included in this sale, less any sums theretofore expended by Seller in repairing or replacing such loss or damage or in collecting such proceeds; and Seller shall assign (without recourse to Seller) Seller’s right to receive any additional insurance proceeds which are at-attributable to the loss of or damage to any property included in this sale. (b) If seller does not elect to make such repairs and restorations, Purchaser may exercise the resulting option under (i) or (ii) of (a) above only by notice given to Seller within 10 days after receipt of Seller’s notice. If Seller elects to make such repairs and restorations and fails to complete the same on or before the adjourned closing date, Purchaser may exercise either of the resulting options within 10 days after the adjourned closing date. (ii) To adjourn the Closing until the first to occur of (1) completion of the repair and restoration of the loss or damage to the point that there is no longer a materially adverse effect on the access to or use of the Unit or (2) the 60th day after the date of the giving of Seller’s aforesaid notice. In the event Purchaser elects to adjourn the Closing as aforesaid and such loss or damage is not so repaired and restored within 60 days after the date of the giving of Seller’s aforesaid notice, then Purchaser shall have the right either to (x) complete the purchase in accordance with this Contract without reduction in the Purchase Price or (y) declare this Contract cancelled and of no further force or effect and receive a refund of the Downpayment, in which latter event neither party shall thereafter have any further rights against, or obligations or liabilities to, the other by reason of this Contract. (d) In the event of any loss of or damage to the Common Elements which does not materially and adversely affect access to or use of the Unit, Purchaser shall accept title to the Unit in accordance with this Contract without abatement of the Purchase Price. 20. Internal Revenue Service Reporting Requirement: Each party shall execute, acknowledge and deliver to the other party such instruments, and take such other actions, as such other party may reasonably request in order to comply with IRC § 6045(e), as amended, or any successor provision or any regulations promulgated pursuant thereto, insofar as the same requires reporting of information in respect of real estate transactions. The provisions of this para. 20 shall survive the Closing. The parties designate Purchaser’s as the attorney responsible for reporting this information as required by the Internal Revenue Code. 21. Broker: Seller and Purchaser represent and warrant to each other that the only real estate brokers with whom they have dealt in connection with this Contract and the transaction set forth herein are New York Real Estate Brokerage LLC and that they know of no other real estate broker who has claimed or may have the right to claim a commission in connection with this transaction. The commission of such real estate shall be paid by Seller pursuant to separate agreement. If no real estate broker is specified above, the parties acknowledge that this Contract was brought about by direct negotiation between Seller and Purchaser and each represents to the other that it knows of no real estate broker entitled to a commission in connection with this transaction. Seller and Purchaser shall indemnify and defend each other against any costs, claims or expenses (including reasonable attorneys’ fees) arising out of the breach of any representation, warranty or agreement contained in this para. 21. The provisions of this para. 21 shall survive the Closing or, if the Closing does not occur, the termination of this Contract. 22. Mortgage Contingency: (Delete if inapplicable) (a) The obligations of Purchaser hereunder are conditioned upon issuance on or before 30 days (the “Commitment Date”) of a written commitment from any Institutional Lender pursuant to which such Institutional Lender agrees to make a loan, other than a VA, FHA or other governmentally insured loan to Purchaser, at Purchaser’s sole cost and expense, of $800,000.00 or such lesser sum as Purchaser shall be willing to accept at the prevailing fixed rate of interest not to exceed or prevailing initial adjustment rate of interest not to exceed for a term of at least 30 years and on other customary commitment terms, whether or not conditioned upon any factors other than an appraisal satisfactory to the Institutional Lender, secured by a first mortgage on the Unit together with its undivided interest in the Common Elements. Purchaser shall (i) make prompt application to an Institutional Lender for such mortgage loan, (ii) furnish accurate and complete information on Purchaser and members of Purchaser’s family, as required, (iii) pay all fees, points and charges required in connection with such application and loan, (iv) pursue such application with diligence, (v) cooperate in good faith with such Institutional Lender to the end of securing such first mortgage loan and (vi) promptly give Notice to Seller of the name and address of each Institutional Lender to which Purchaser has made such application. Purchaser shall comply with all requirements of such commitment (or of any commitment accepted by Purchaser) and shall furnish Seller with a copy thereof promptly after receipt thereof. If such commitment is not issued on or before the Commitment Date, then, unless Purchaser has accepted a commitment that does not comply with the requirements set forth above Purchaser may cancel this Contract by giving Notice to Seller within 5 business days after the Commitment Date, in which case this Contract shall be deemed cancelled and thereafter neither party shall have any further rights against, or obligation or liabilities to, the other by reason of this Contract except that the Downpayment shall be promptly refunded to Purchaser and except as set forth in para. 21. If Purchaser fails to give Notice of cancellation or if Purchaser shall accept a commitment that does not comply with the terms set forth above, the Purchaser shall be deemed to have waived Purchaser’s right to cancel this Contract and to receive a refund of the Downpayment by reason of the contingency contained in this para. 22.
business in New York State; insurance company duly organized or licensed to do business in New York State; insurance company duly organized or licensed to do business in New York State; mortgage banker licensed pursuant to Article 12-D of the Banking Law; and any instrumentality created by the United States or any state with the power to make mortgage loans. (Delete if inapplicable)(c)Purchaser and Seller agree that the submission of an application to a mortgage broker registered pursuant to Article 12-D of the New York Banking Law (“Mortgage Broker”) shall constitute full compliance with the terms and conditions set forth in para. 22(a)(i) of this Contract, and that Purchaser’s cooperation in good faith with such Mortgage Broker to obtain a commitment from an Institutional Lender (together with Purchaser’s cooperation in good faith with any Institutional Lender to which Purchaser’s application has been submitted by such Mortgage Broker), and the prompt giving of Notice of Purchaser to Seller of the name and address of each Mortgage Broker to which Purchaser has submitted such an application shall constitute full compliance with the terms and conditions set forth in para. 22 and (vi) of this Contract. 23. Gender: As used in this Contract, the neuter includes the masculine and feminine, the singular includes the plural and the plural includes the singular, as the context may require. 24. Entire Contract: All prior understandings and agreements, written or oral, between Seller and Purchaser are merged in the Contract and this Contract supersedes any and all understandings and agreements between the parties and constitutes the entire agreement between them with respect to the subject matter hereof. 25. Captions: The captions in this Contract are for convenience and reference only and in no way define, limit or describe the scope of this Contract and shall not be considered in the interpretation of this Contract or any provision hereof. 26. No Assignment by Purchaser: Purchaser may not assign this Contract or any of Purchaser’s rights hereunder. 27. Successors and Assigns: Subject to the provisions of para. 26, the provisions of this Contract shall bind and inure to the benefit of the Purchaser and Seller and their respective distributees, executors, admin-stators, heirs, legal representatives, successors and permitted assigns. 28. No Oral Changes: This Contract cannot be changed or terminated orally. Any changes or additional provisions must be set forth in a rider attached hereto or in a separate written agreement signed by both parties to this Contract. 29. Contract Not Binding Until Signed: This Contract shall not be binding or effective until properly executed and delivered by Seller and Purchaser. 30. This contract includes those terms and conditions contained in the Rider that is attached hereto and made part hereof. 31. Contract Not Binding Until Signed: This Contract shall not be binding or effective until properly executed and delivered by Seller and Purchaser. It is expressly understood and agreed by the parties hereto that this Contract shall not constitute an offer or create any rights in favor of Purchaser and shall in no way obligate or be binding upon Seller and this Contract shall have no force or effect unless and until the same is duly executed by Seller and Purchaser and a fully executed counterpart hereof is delivered by Seller to Purchaser and the Downpayment has cleared through the Escrowee’s account. Delivery of a fully executed counterpart of this Contract to Purchaser’s attorney shall be deemed delivery to Purchaser. Purchaser agrees that this Contract is not to be recorded and any attempt to do so shall be a default hereunder. This Contract may be executed in one or more counterparts, each of which shall constitute an original and all of which, when taken together, shall constitute but one and the same instrument. 32. Governing Law: This Contract and the Schedules annexed hereto (a) shall be governed by and construed in accordance with the laws of the State of New York and (b) shall be given a fair and reasonable construction in accordance with the intentions of the parties hereto. For purposes of construction of this Contract, provisions, which are deleted or crossed out, shall be treated as if never included herein. If any provision of this Contract is invalid or unenforceable as against any person or under certain circumstances, the remainder of this Contract and the applicability of such provision to other persons or circumstances shall not be affected thereby. Each provision of this Contract shall be valid and enforceable to the fullest extent permitted by law. 33. No Waiver: No failure or delay of either party in the exercise of any right given to such party hereunder or the waiver by any party of any condition hereunder for its benefit (unless the time specified herein for exercise of such right, or satisfaction of such condition, has expired) shall constitute a waiver of any other or further right nor shall any single or partial exercise of any right preclude any other or further exercise thereof or any other right. The waiver of any breach hereunder shall not be deemed to be waiver of any other or any subsequent breach hereof. 34. Waiver of Trial by Jury: Both Purchaser and Seller hereby irrevocably waive all right to trial by jury in any action, proceeding or counterclaim arising out of or relating to this Contract. In connection with any litigation arising out of this Contract, the prevailing party shall be entitled to recover all costs thereof, including, without limitation, reasonable attorneys’ fees and disbursements for services rendered in connection with such litigation (including appellate proceedings and post judgment proceedings). 35. Purchaser shall accept the walls in the Unit subject to such minor chips, holes and other indentations as are ordinarily created by the removal of nails, screws or similar items used to hang pictures or other removable items. Seller is not obligated to install any equipment or appliances in the Unit or otherwise make any repairs, improvements or decorations to the Unit or its equipment, appliances and fixtures, except as may be specifically provided for in this contract. 36. The Contract and this Rider may be executed in more than one counterpart, each of which, when taken together, shall be deemed to be one (1) instrument. The Contract and this Rider may be executed and delivered by facsimile transmission or by email via .pdf format, in each case, with the same force and effect as originals. 37. The Purchaser herein acknowledges that he has a right to a summary of the heating and/or cooling bills or a complete set of said bills, types and areas of insulation installed by the seller in the premises during his ownership or by any previous owners known to seller under Article 17-103 of the Energy Law of the State of New York commonly known as the Truth in Heating Law. The Purchaser hereby waives his right to copies of said bills or a summary of said bills and further waives his right to a statement of the types and areas of insulation and acknowledges that he has not requested them in connection with this transaction. 1. Zoning laws and regulations and landmark, historic or wetlands designation which are not violated by the Unit and which are not violated by the Common Elements to the extent that access to or use of the Unit would be materially and adversely affected. 2. Consents for the erection of any structure or structures on, under or above any street or streets on which the Building may abut. 3. The terms, burdens, covenants, restriction, conditions, easements and rules and regulations set forth in the Declaration, By-Laws and rules and regulations of the Condominium, the Power of Attorney from Purchaser to the board of managers of the Condominium and the floor plans of the Condominium, all as may be amended from time to time. 4. Rights of utility companies to lay, maintain, install and repair pipes, lines, poles, conduits, cable boxes and related equipment on, over and under the Building and Common elements, provided that none of such rights imposes any monetary obligation on the owner of the Unit or materially interferes with the use of or access to the Unit. 5. Encroachments of stops, areas, cellar steps, trim, cornices, lintels, window sills, awnings, canopies, ledges, fences, hedges, coping and retaining walls projecting from the Building over any street or highway or over any adjoining property and encroachments of similar elements projecting from adjoining property over the Common Elements. 6. any state of facts which an accurate survey or personal inspection of the Building, Common Elements or Unit would disclose, provided that such facts do not prevent the use of the Unit for dwelling purposes, or if a storage unit, for storage purposes. For the purposes of this Contract, none of the facts shown on the survey, if any, identified below, shall be deemed to prevent the use of the Unit for dwelling purposes, and Purchaser shall accept title subject thereto. 7. The lien of any unpaid common charge, real estate tax, water charge, sewer rent or vault charge, provided the same are paid or apportioned at the Closing as herein provided. 8. The lien of any unpaid assessments to the extent of installments there-of payable after the Closing. 10. Notes or notices of violations of law or governmental orders, ordinances or requirements (a) affecting the Unit and noted or issued subsequent to the date of CLOSING by any governmental department, agency or bureau having jurisdiction and (b) any such notes or notices affecting only the Common Elements which were noted or issued prior to or on the date of this Contract or at any time hereafter. 11. Any other matters or encumbrances subject to which Purchaser is required to accept title to the Unit pursuant to this Contract. Pro Tip: Buying your first home? Figure out what your closing costs will be with our handy Closing Cost Calculator for Buyers in NYC. Next, find a great buyer’s agent to guide you through the NYC closing process, from contract to closing. In the event of any inconsistency between the provisions of this Second Rider and the printed form of Contract of Sale, the provisions of this Rider shall govern and control. 1. Notwithstanding anything to the contrary herein, Seller represents and warrants that all heating, plumbing systems, electrical, mechanical and air conditioning systems and fixtures, pipes, wiring, appliances, doors, windows and lighting fixtures, including fireplaces, if any, and other utilities installed or serving the Unit, and the Personal Property to be transferred to Purchaser hereunder shall be in working order and condition at the time of Closing, subject to normal wear and tear, except to the extent the Condominium is responsible for same pursuant to the terms of the Offering Plan or By-Laws. If there are any plumbing, heating, air conditioning or electrical problems to repair prior to closing which are the responsibility of the Condominium to repair, Seller, upon learning of same or receiving notice of such condition, shall promptly notify the Condominium of same and shall use Seller’s reasonable efforts to have such problems corrected prior to closing and shall deliver all documentation, if any, regarding such repair to Purchaser at closing. 2. Seller warrants and represents that to the best of Seller’s knowledge there have been no water leaks into the Unit within the last twelve (12) months and that Seller has not been notified of any water leaks which purport to emanate from the Unit within such twelve (12) month period. 3. Seller represents that the Seller has not, in the past twelve (12) months, lodged any written complaints with the building’s superintendent or other staff, the building management or the Condominium Board regarding noises, smells on the part of nearby unit owners. Furthermore, the Seller represents they have not been issued any written complaints regarding lack of heat or hot water, low water pressure, banging pipes, and insect and/or rodent infestation, including but not limited to bed bugs. 4. Seller hereby represents that at the time of the Closing there will be installed and operable at the premises at least one single station smoke detecting and carbon monoxide alarm device in compliance with Section 378, subdivision 5 of the New York Executive Law. Seller shall, at Closing, deliver an affidavit of compliance with said law. 5. Seller represents that no alterations or additions were made to the Unit without the required consent of the Condominium, if any, or without compliance with governing codes, laws, rules and regulations. Seller shall be required to close out any open permits relating to this apartment prior to Closing. 6. Supplementing the provisions of Paragraph 14 of the printed form of the Contract, it is agreed that any notice given under this paragraph may be given to the attorney for the party by the means set forth in said paragraph or by facsimile. Notice given by facsimile shall be effective upon receipt. 7. Supplementing the provisions of Paragraph 5 of the printed form of the Contract, Seller represents that, as of the date of this Contract, Seller has no actual knowledge of any pending or contemplated increase in said Common Charges and/or Assessment. Promptly after learning of or receiving notice of any such increases, Seller shall notify Purchaser of any such increases. 8. At reasonable times and upon reasonable notice to Seller (which may be by telephone) and by appointment only, Purchaser and Purchaser’s appraiser, designer, architect or similar personnel shall have the right to enter the Unit for purposes of inspection, taking measurements and other similar activities, a reasonable number of times prior to closing, during reasonable, mutually convenient hours. 9. Seller shall at closing turn over any warranties and owner’s manuals for any of the systems or appliances in the Unit. Seller also shall provide to the extent available any information, drawings or architectural plans relating to the alterations that were made to the Unit by the Seller. 10. Notwithstanding the provisions of Paragraph 22 of the Contract of Sale, in the event the Institutional Lender shall issue a commitment which shall otherwise comply with the provisions of said Paragraphs and said lender shall thereafter rescind or cancel the commitment or shall refuse or fail to fund the loan referenced in said paragraphs, for any reason other than one relating to Purchaser, and after Purchaser has used his/her best efforts to persuade the Institutional Lender to go forward with the loan, Purchaser may elect to cancel this agreement whereupon the Contract shall be deemed cancelled. Neither party shall have any further rights against, or obligations or liabilities to the other by reason of this Contract except that the Downpayment shall promptly be refunded to Purchaser. 11. In the event that the removal by Seller of anything which had been affixed or hung on the walls of the unit results in a hole remaining which is larger than an ordinary nail or screw hole and which is not capable of being repaired by spackling or other similar compound, Seller shall, prior to closing and at Sellers expense, repair the hole in question and refinish the affected area so as to create a uniform surface and appearance with the balance of the wall in question. Notwithstanding anything else contained herein, Seller shall replace any lighting fixtures removed pursuant to this Agreement with functioning “builder’s quality” fixtures, which shall be installed by a licensed electrician (the parties, if mutually agreeable, can establish a credit to the Purchaser in lieu of the installation of some or all of the fixtures). In addition, Seller shall repair all holes caused by the removal of flat screen televisions mounted on the wall, if any. Seller shall cause the removal of such light fixtures and/or televisions to be done in such a way as to minimize the damage to the surrounding wallpaper/paint/wall/ceiling and repair any damage to the surrounding area caused by the removal of the fixtures. 12. Seller represents that Seller is a New York State resident and the Unit is the Seller’s primary residence. In the event Seller is not a New York State resident, Seller shall prepare Form IT-2663 and pay the estimated New York State Capital Gains Tax at the closing. Notwithstanding anything to the contrary contained herein and subsequent to the actual closing hereunder, in the event a determination is made by the New York City Department of Finance that a previously granted and received tax abatement issued to Seller is revoked or reversed (due to reasons, including but not limited to, Seller being an entity or trust or the Unit not being Seller’s primary residence), any and all charges to Purchaser in connection therewith shall be promptly paid by Seller. This provision and Sellers obligations hereunder shall survive the closing. 13. Closing of title shall be contingent on the condominium having a valid Certificate of Occupancy issued by the NYC Department of Buildings. Pro Tip: Buying a starter home? Check out first time buyers programs in NYC which can assist with your down payment or closing costs. Next, do a thorough buying vs renting analysis to make sure it makes sense to purchase. Then, read our guide to buying a studio in NYC. Keep in mind that studios are often lofts and can be quite large! SELLER’S RIDER ANNEXED TO AND FORMING A PART OF THE CONTRACT OF SALE, DATED JULY 19, 2018 BETWEEN BRANDON HOLT, (“SELLER”) AND DYLAN HOFFSON (“PURCHASER”), FOR UNIT 2 IN THE BUILDING LOCATED AT 111 HECTOR STREET, NEW YORK, NY 10052. 1. Wherever there is a conflict between this Rider and the printed form of Contract to which this Rider is attached, the provisions of this Rider shall control and govern. 2. The failure of either party to insist upon the performance of any obligation to be performed by the other party shall not be deemed to be a waiver thereof or of any preceding or succeeding breach thereof or of any other obligation. No provision of this Contract may be waived except by a writing signed by the party waiving any provision hereof. The waiver of any breach of this Contract shall not be deemed a waiver of any preceding or subsequent breach of the same obligation, or of any other obligation, to be performed hereunder. No extensions of time for the performance of any obligations or acts shall be deemed or construed as an extension of the time for the performance of any other obligations or acts. 3. The parties agree that in any action brought to enforce this Contract, the prevailing party shall be entitled to reasonable attorney’s fees and court costs. 4. Supplementing and amending paragraph 2 of the printed form of Contract, no part of the purchase price is allocated to any of the items of property referred to in paragraph 2 of the printed form of Contract. Notwithstanding the foregoing or anything else in the Contract to the contrary, if any sales tax is required to be paid in connection with the transfer of such property, Purchaser shall pay all such tax. Such obligations hereunder shall survive the Closing. 5. Supplementing paragraph 5(d), Seller makes no representation or warranty as to the real estate taxes associated with the Unit. Purchaser shall have the sole responsibility for obtaining information with respect to real estate taxes. 6. Supplementing and amending paragraph 9 hereof, and notwithstanding anything therein to the contrary, Purchaser shall pay all fees typically imposed by Condominium upon Purchasers in connection with the processing of the application in connection with this sale, and Seller shall pay all fees typically imposed by Condominium upon Sellers in connection with the processing of the application in connection with this sale. 7. Except as provided for in the Contract and Rider, Purchaser acknowledges that Seller, or agents of Seller, have not made any representation as to the physical condition, operation, or any other matter or thing pertaining to the Unit. The Purchaser acknowledges that it has personally made a thorough inspection of the Unit and is familiar with the condition of same. 8. Supplementing paragraph 18(d) of the printed form, if the cost to cure any objectionable condition shall exceed $15,000, and the Purchaser is not willing to deem the objectionable condition a permitted exception under the Contract, the Seller shall have the option cancel this Contract by Notice to Purchaser, and the sole obligation and liability of Seller for such termination shall be to refund the Down Payment to Purchaser, after which none of the parties shall have any further obligations under this Contract. However, Seller shall remain obligated to cure consensual liens and mortgages against the Unit regardless of cost. 9. Supplementing paragraph 5 of the Contract, it is agreed that: (a) Seller is not obligated to install any equipment or appliances in the Unit or otherwise to make any repairs, improvements or decoration to the Unit or its equipment, appliances and fixtures; and (b) Purchaser acknowledges having entered into this Contract and Rider without relying upon any promises, statements, estimates, representations, warranties, conditions or other inducements, express or implied, oral or written, not set forth in the Contract and Rider. 10. Purchaser shall not record this Contract. If Purchaser records this Contract, the Seller may cancel the Contract by Notice to Purchaser, and retain the Down Payment as liquidated damages, after which none of the parties shall have any further obligations under this Contract. 11. The Purchaser herein acknowledge that they have a right to a summary of the heating and/or cooling bills or a complete set of said bills, types and areas of insulation installed by the seller in the premises during his ownership or by any previous owners known to seller under Article 17-103 of the Energy Law of the State of New York commonly known as the Truth in Heating Law. The Purchasers hereby waive their right to copies of said bills or a summary of said bills and further waive their right to a statement of the types and areas of insulation and acknowledge that they have not requested them in connection with this transaction. 12. Purchaser represents and warrants to Seller that Purchaser (i) has not filed a bankruptcy or insolvency proceeding within the past five (5) years; (ii) has sufficient funds in connection with the purchase of the Unit; (iii) that Purchaser has not had an application for a loan denied by a lending institution within the last five (5) years; (iv) has no outstanding judgments or tax liens and knows of no threatened lawsuit or claim. 13. Purchaser hereby agrees to return to Seller any refund in real estate taxes inadvertently received by Purchaser covering the period of time the Unit was owned by Seller. This provision shall survive closing. 14. Purchaser agrees to submit the Board application within fifteen business (15) days of the fully executed Contract of Sale unless a Loan Commitment Letter is required, in which event Purchaser agrees to submit the Board application within five (5) days of the Commitment Date as such term is defined in the form Contract. 15. This Contract may be signed in counterparts with the same effect as if executed singularly. The delivery of an executed counterpart of this Contract, whether with original duplicate or facsimile (including a PDF copy sent via email) signatures, executed by a party shall have the same force and effect as if such party had delivered an original signature on this Agreement.